“Tree work” on Broadalbin Street on Friday afternoon. The cutting down of more than 100 street trees in downtown Albany has begun. No great news here, just noting the start of yet another early phase of the $8.4 million streetscape improvement program taking place this year. 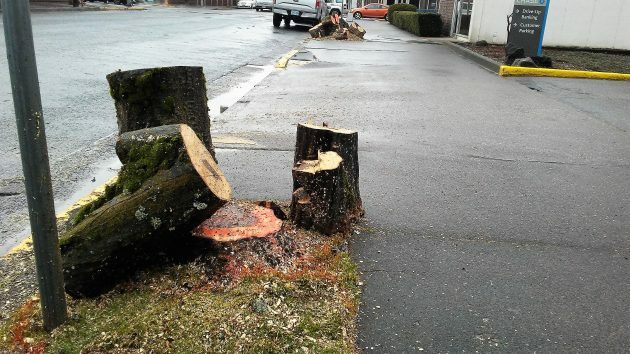 The city contracted with Buena Vista Arbor Care, the low bidder at about $99,000, to take down trees that will be replaced with new and different ones in the course of the street reconstruction scheduled later this year. The cutting was being done in the winter to avoid complications with the Migratory Bird Treaty Act of 1918 as amended, which prohibits doing harm to any of dozens of species of birds. 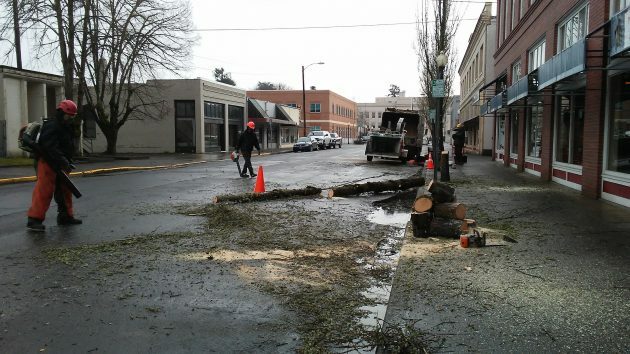 The trees — 130 of them, the city said — are coming down on Second Avenue between Washington and Lyon streets, Third between Ferry and Lyon, Broadalbin between Second and Third (where the top photo was taken), and Ellsworth and Lyon from First to Eighth. The city administration announced in early January that the tree cutting would start Jan. 11 and be done by and end of February. I don’t know when they actually started, but I hadn’t noticed the work until this week. The scene on Third between Lyon and Elllsworth. City government reminds us once again that CARA’s purpose is to pick winners and losers. I get that you and a handful of others don’t like a URD as a concept. Thankfully, many of us in Albany are trying to make Albany better. It must gall the heck out of you that URDs are so pervasive & successful across Oregon. How are they down in your new location? Tax increment financing is not legal in Arizona. In the past bills have been run through the state legislature, but none have passed. I’m sure the populace of your town will agree you’re a very good fit and contribute much to the prosperity & well being of the community. Could you try to make Albany better without extracting more and more money from its citizens? THAT would be good leadership! I was shocked to see, “The cutting down of more than 100 street trees in downtown Albany has begun.” Why would Albany ruin the charm of its historical downtown? Thank you, Hasso for the further details, “…trees that will be replaced with new and different ones in the course of the street reconstruction scheduled later this year.” This is actually pleasing news. This person would want to see which birds signed on to the Migratory Bird Act of 1918. Who exactly are we dealing with? Could President Trump re-open negotiations on this treaty to make certain American Homo sapiens, particularly struggling white middle class folk, are being treated fairly. American humans first! Gordon Shadle reminds us again that you can lead a Shadle to facts, but he’ll never learn to think. So the city chose the type of tree to be planted initially and that cost us money and now we pay for cutting them down and replanting. Way to go city—really looking out for the folks who pay your wages. Seriously? You’re really looking hard for something to complain about aren’t you? I’ve been wondering for years why you stay here if you hate it so much? You could save us (the “city”) some money on lawyer costs if you moved. Its a win-win. What happened to Albany – City of Trees that is on the signs as you drive into Albany? Sounds like someone has it in for trees in a bad way. It looks like a tree massacre to me. Why do they plant trees under power lines? At least plant trees that only grow so high.Why don’t they plant cherry, apple and pear trees? People could pick their own fruit. Or the ADA could pick it and offer it up at the farmers’ mkt. Like the idea and I second the motion.